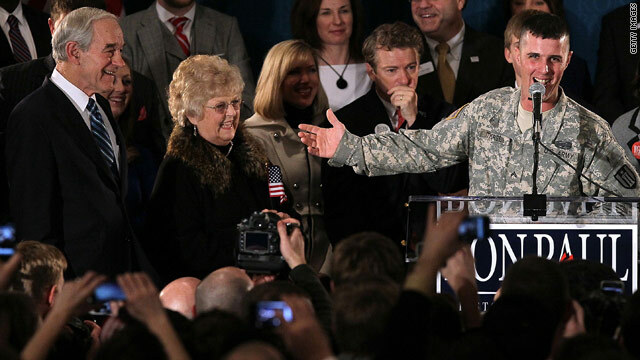 (CNN) - Ron Paul spent Tuesday heralding his support among members of the military, but one active-duty supporter may be in trouble after lauding Paul on stage while wearing his Army uniform. Army Cpl. Jesse Thorsen spoke during Paul's speech at his headquarters in Ankeny, Iowa, Tuesday night. Paul invited Thorsen to speak on stage after a technical glitch cut short an earlier live interview on CNN. Guidelines laid out in the federal Hatch Act specifically prohibit uniformed members of the military from making political speeches or taking official roles on political campaigns. Members of the military are permitted to attend political rallies, but must not be wearing their uniform while in attendance. On stage with Paul, Thorsen was wearing green Army fatigues. On Tuesday evening, Paul Rieckhoff, executive director and founder of the veterans' advocacy organization Iraq and Afghanistan Veterans of America, wrote on his Facebook page that Thorsen would likely be reprimanded. "The soldier that spoke tonight on behalf of Ron Paul is gonna be in a bit of trouble," Rieckhoff said. "Politics in uniform is a big no-go. And Paul and his campaign should know better. Troops are bound by the (Uniform Code of Military Justice)." Paul called Thorsen on stage during his caucus-night speech in Iowa Tuesday, saying the active duty Army corporal had been with his campaign for "quite a few years." "He's been serving in the military for ten years, and he's been overseas a lot," Paul said. During his address to Paul's supporters, Thorsen lauded the White House hopeful's foreign policy platform. "If there's any man out there that has a vision for this country, it's definitely him," Thorsen told the crowd. "His foreign policy is by far, hands down, better than any candidates out there, and I'm sure you all know that." Thorsen said being on stage with Paul was "like meeting a rock star." Paul's campaign did not respond to a request for comment. –CNN's Dana Bash and Adam Levine contributed to this report. Maybe that why Ron Paul's son Rand Paul looked so funny as the guy spoke. I guess he couldn't believe his old dad unwisely summoned the guy to the stage to speak. That solders should be kick out of the service! Ron Paul should know better. But look who we are talking about. Paul knew this was a violation of the Hatch Act but mindfully chose the public attention over this guys political career. Ron Paul is a waste of time. All those years in Congress and only ONE of his bills has been passed. He is nothing but false hope for those blind enough to follow. I meant the guys military career. So basically you are allowed to die when they send you to war, but you can't have a say on the next guy that will send you to your death. America in all it's splendor, land of the free you say? 1) How often have you said "People of any religion can be a soldier, but it takes a Christian to lead." My CO did my first day as an LT.
2) How many times have you changed the toast at dining ins and outs from "to the president of the United States," to "to the office of the President," depending one whether the president belonged to the "right" political party. Yeah, you. You know who you are....You deserved to lose that 2nd star on retirement. 3) How many times have you demanded that every television in a public space under your sphere of control be set to FOX news and nothing else because "All other media is lies and distractions." 4) How many times did you suggest that community co-op programs for your subordinate units were best reserved for "organizations of the right pedigree" and pushed your LT's and CPTs to run them only with Christian organizations, like Habitat for Humanity, Salvation Army, or the Boy Scounts over their secular equivalents? Gentlemen, the day you answer these questions and satisfy yourself that you comply with the Hatch Act in spirit, then punish the E4 for violating the letter. But until that day, you're liars and hypocrites who had best hope I don't name names. Do right. Both the UCMJ and Hatch Act prohibit Cpl. Thorsen's activity. Every soldier, sailor, airman, Marine, and civil servant knows that. I hope they throw the book at him–he knew better. Separation of the military and politics is a bedrock principle of American democracy. "He's been serving in the military for ten years, and he's been overseas a lot"
I think we need some fact checking here. A corporal is an E-4 that has NCO duties (probably just needed more NCOs for CQ duty) and therefore gets an added "boost" to his title. E-4 is the last mandatory promotion you get, which you get E-4 after 24 months in service. So if he's been in the Army for 10 years and he's been stuck at E-4 he's been in a bunch of trouble or just in big trouble recently and got demoted. Odds are he's not, and its more politics being played by trying to show a "10 Year" veteran supports Paul. Veterans like Paul because he isn't a liar. He maybe slightly crazy and off the mark on some issues but unlike the other "statesmen" we have running, he's consistant on his views and doesn't apologize to anyone about it. That is something any Solider, Marine, Seamen, or Airmen can respect. Why can't they follow the rules. I think it was a mistake and he was excited. I hope we don't attack a two time Iraq veteran over this. Especially, before we ship him off to blow up Iran. Well as long as it's Paul or any other unserious person, such as you typical democrat, it is ok. They have no respect for the military, and certainly are ok with using them as pawns to push their agendas. Really no suprise to me. Note to Army Chief of Staff: Leave the kid alone. He probably didn't realize he was in violation of any Army Reg or the UCMJ. Have is CO give him a "slap on the wrist and sin no more" speech and forget the issue, otherwise this is gonna blow up in your faces. Take it from a former bubble-head – you ain't gonna win on this one. Perhaps he wouldn't have had to take to the stage if CNN had not cut him off in the middle of his interview. Paul doesn't care about this vet, or any others. He knew this was going to be a problem and is happy to leave this guy out to dry. As Rick Perry said: Oops! That man has the American people behind him. Why don't you do the American thing and get behind our servicemen and women too CNN.